A high-achieving solicitor has been jailed for two and a half years for allowing her elderly mother, Cecily Kurtz, to die in ‘a pool of diarrhoea’, before ‘leaving her to rot’. To make matters even worse, if such a thing is possible, her daughter, Emma-Jane Kurtz, was a practising solicitor who specialised in ‘elder abuse’, ‘power of attorney’, and ‘preserving home assets in the event of long-term care’. Police officers from the Thames Valley Police attended their home in Didcot after a report of a 79-year-old woman’s death at the property. 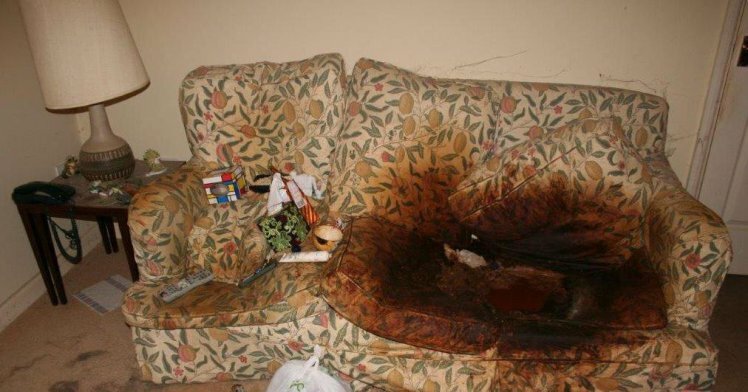 There they found the sofa on which Mrs Kurtz passed away in her own faeces and urine. A woman has been jailed for neglecting her own mother who died in squalid conditions. Emma-Jane Kurtz, aged 41, of Blackwater Way, Didcot, was jailed for two and a half years today. Apparently Cecily Kurtz had been dressed in the same clothes for the past decade, reports The Sun. Medical crews who went to the home were incredibly concerned by the state of the property and so launched an investigation into the manner of Cecily’s death. Mrs Kurtz was found on a sofa and she had been slumped over with her chin on her knees for five days. Emma-Jane Kurtz said she had gone in to the room with her mother three or four times a day. There had been many opportunities over months and years to help her and remove her from that situation. This deeply tragic, yet avoidable, case is a reminder that we all have a responsibility to look out for others in our community. If you haven’t seen someone elderly or vulnerable, even if they live with a family member, ask about them and check on them. THE DAUGHTER OF A WOMAN: who died covered in faeces on a sofa in the same clothes she had worn for a decade has been jailed. Emma-Jane Kurtz, 41 of Didcot was found guilty. This was a sad case resulting in the untimely death of Cecily Kurtz. Cecily lived at the dilapidated property with her husband and daughter, Emma-Jane Kurtz, a practising solicitor whose areas of specialism included, “Elder abuse”, “Power of Attorney”, and “Preserving home assets in the event of long-term care”. Cecily was found dead on a sofa sitting in a pool of diarrhoea in the most appalling and filthy state. She had been neglected for years in the most horrifically squalid conditions, she weighed 39 kg was emaciated and her long hair was matted. She was covered in her own excrement and had numerous urine burns to her body. The investigation established that she had suffered from mental illness for many years and hadn’t been seen by others for a period of 10 years before her death. She had suffered unimaginably and died in the most undignified manner. It is rare to come across a case that involves such sheer and blatant neglect against a vulnerable, elderly woman, by someone who was supposed to love and care for her. Emma-Jane Kurtz was subsequently charged in connection with the offence before being sentenced to two and a half years in prison. Neglect doesn’t get much more horrific than this.